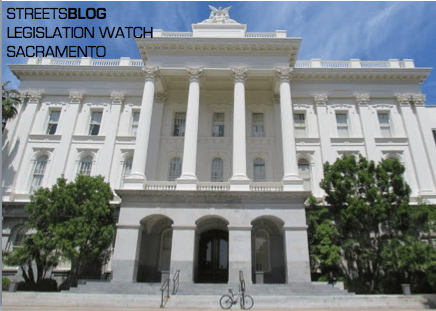 Here is Streetsblog’s weekly highlight of California legislation related to sustainable transportation. The legislature is in recess until August. Light rail no longer illegal in LA’s San Fernando Valley: A.B. 577 from Adrin Nazarian (D-Sherman Oaks) was signed into law by Governor Jerry Brown last week. The bill repealed a 1990 law that prohibited construction of light rail along a section of the Orange Line, and thus opens up the possibility of replacing the Orange Line BRT with rail. Whether that’s good or bad is up for debate, and Streetsblog has presented arguments both for and against the line’s conversion. Replacing the car-centric LOS planning metric: Those who’ve been waiting with bated breath to find out what will replace Level of Service (LOS) as a transportation planning metric in California Environmental Quality Act requirements were disappointed when the July 1 deadline came and went without any pronouncements from the Office of Planning and Research (OPR). However, it looks likely that some version of Vehicle Miles Traveled will replace LOS, which has given rise to sprawling development patterns and wide streets unsuitable for walking and bicycling. When OPR does publish its recommendations, there will be a 45-day public comment period, and Streetsblog will provide the details. Funds for bike and pedestrian projects: The Active Transportation Program, which provides funding for pedestrian and bicycle infrastructure projects, has logged all the proposals received as of its May 21 deadline. A total of 770 projects applied for the $124.2 million that is available for fiscal year 2014-15. The projects include bicycle and pedestrian plans, bridges, sidewalk and signal improvements, Safe Routes to Schools programs, traffic calming and speed reduction efforts, and a host of large and small infrastructure improvements throughout the state. Active Transportation Project applications pile up at Caltrans headquarters on May 21. It will me interesting to see whether LA will actually transform itself from the auto-choked sprawling mess that it is, to an actual collection of cities.